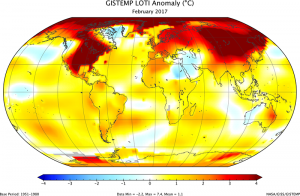 NASA reported this week that their calculated global temperature for February 2017 shows it as the second warmest on record, slightly below the record-setting year of 2016 (which had a strong El Niñ0). NOAA should be releasing their numbers in a few days. You can read about it at https://data.giss.nasa.gov/gistemp/news/20170315/.